Just when you thought brownies couldn’t get any more delicious, they morph into a chewy, fudgy, crackled-top cookie! Add some salted caramel buttercream, and make them into sandwiches… and slip into a blissful, sugar-induced coma. I highly recommend it. 1.) Preheat your oven to 350°. 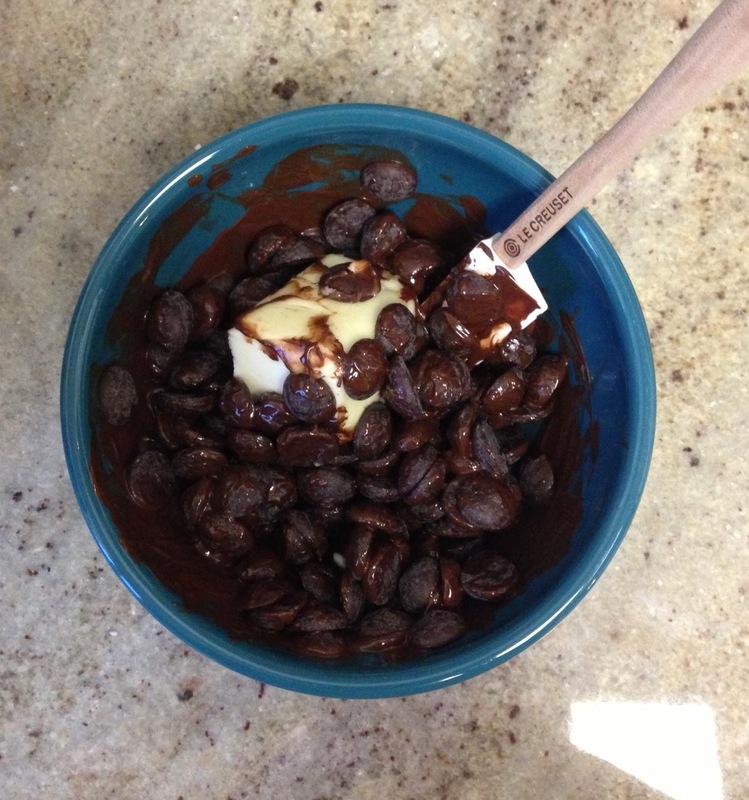 Place the chocolate and butter into a small bowl, and microwave for 30 second intervals, stirring thoroughly after each 30 second interval. Continue until the butter and chocolate are completely melted (it only took me a minute, total). Set aside. 2.) In the bowl of a stand mixer fitted with the paddle attachment (or in a large mixing bowl, using a hand mixer), combine the eggs, sugars, and vanilla. Beat on medium for about 3 minutes, until the mixture is pale in color, and a bit foamy. 3.) Add the (slightly cooled) chocolate mixture to the egg mixture, and combine well. 4.) Whisk together the flour, salt, and baking powder. Add the flour mixture to the chocolate mixture in 3 batches, mixing until just combined after each addition. 5.) Allow the dough to sit for about 10 minutes; as the chocolate mixture continues to cool, the dough will firm up a bit, and be easier to scoop. 6.) Line a baking sheet with parchment paper or a silicone liner (don’t skip this step; these cookies stick pretty fiercely, even with the silicone liner). Use a 2 teaspoon scoop to portion out cookies, about 2″ apart on the sheet pan. 7.) Bake for about 8 minutes, until the surface of the cookies is cracked, and they are just set. 8.) Allow the cookies to cool on the sheet pan for about 3-4 minutes, and then carefully move them to a cooling rack. Using a very thin, flexible spatula to move them will help keep them from falling apart! 9.) While the cookies cool, make the buttercream. Combine the butter, powdered sugar, heavy cream, and salted caramel sauce in the mixer. If there is not enough caramel flavor in the buttercream, add more salted caramel sauce (one tablespoon at a time) until you achieve the desired flavor. 10.) Pipe or spread the buttercream onto the bottom of half the brownie cookies, and gently sandwich a second cookie on top of the buttercream. These cookie sandwiches are small, but they’re RICH. 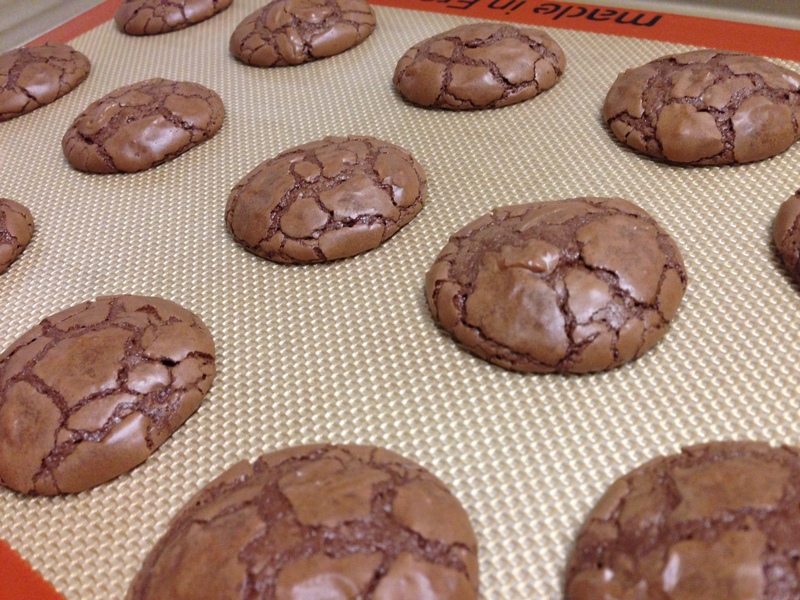 The brownie cookies are nice and chewy and fudgy, but thin enough to still be fairly light. One or two will surely be enough to satisfy your sweet tooth! This is the 3rd time I’ve seen this recipe in the last 2 weeks. I think it’s a sign for me to make them!! They look amazing! Oh wow, these look and sound ridiculously delicious! How do you make the salted caramel sauce? Susan, I usually buy a jar of salted caramel sauce (it’s pretty easy to find, but I get mine at Trader Joe’s or Williams-Sonoma). If you want to make your own, you’ll want to mix together 1 cup granulated sugar and 1/4 cup water in a medium saucepan. Set the pan over medium heat, and allow the sugar mixture to come to a boil – do NOT stir it once the heat is on! Once the mixture reaches a medium brown/caramel color, remove the sugar mixture from the heat and add in 3/4 cup of heavy cream, and stir to combine (it will bubble up pretty vigorously, so be prepared, and stand back). Keep stirring until it has stopped bubbling, and then stir in 1/4 teaspoon of fleur de sel, or other sea salt. Allow the sauce to cool, and use it however you’d like! Good luck! T (3 T salted butter) stands for what? can you tell in grams? It stands for 3 tablespoons… Which should be about 40 grams of butter. Good luck!! Thanks Tina! So nice of you for quick reply. I am gonna make these for this Eid. Oh wow. I need some for breakfast!! Come link them up this Wednesday at my party! I just made a batch of these iseen them on my aunt’s face book with a link to your sight … Wow these cookies are awesome. They turned out super cute and super yummy! Definitely going in my favorites for recipes. I have enough frosting left to make another batch might have to get some more chips and make more. I could not find salted caramel sauce so I used ghiradelli caramel sauce and added just a touch of kosher salt to my frosting, yummy. Definitely use parchment paper they come off really easy. Thank you for sharing they are amazing. Fun to make too. Hi Rebecca! If you make them as directed, and get 18 sandwiches out of the recipe, the nutritional info is as follows (per sandwich cookie): 275 calories, 15.6 grams of fat, 34.2 grams of carbs, 1 gram of fiber, and 2.2 grams of protein. I hope that helps! Thank you so much for the quick response. They are 8 WW Plus points each. Thank You! I’m making a batch tomorrow. Is ice cream topping the same as caramel sauce? It’s all I can seem to find. Going to try to make some tonite. Very excited! Hi Krystal – the caramel ice cream topping will work just fine! It might be a little thinner than a straight caramel, so just add it to your buttercream a little at a time, so the filling doesn’t end up too thin. Add a good pinch of kosher salt for the salted caramel flavor. Good luck, and enjoy!! They were awesome.. but i had to do it more dip like.. half and half is not the same as heavy whipping cream.. Opps but yummy none the less!! Sandra, that’s correct! When you first make it, the dough will be a bit wet and runny – once you let it sit for a little while, and the melted chocolate in the batter cools, the batter will firm up. The low flour content is part of what keeps the brownie cookies nice and chewy and fudgy 🙂 Enjoy! I just made these and they’re fantastic! Thanks so much for taking the time to write out all the details in this recipe and for sharing it! My buttercream seems a little runny. Any suggestions? I’d put it in the fridge for about 15-20 minutes, and then mix for another few seconds… It may have gotten a little too warm while mixing, and cooling it down should help firm it back up. Alternatively, you can add some more powdered sugar – just make sure you don’t make it TOO sweet! Good luck! Just made these and they were awesome! Made smaller cookies for more sandwiches and added about 1/4 cup salted caramel sauce to make the buttercream have that crisp flavor. they are to die for! also, made my own caramel sauce like one lady suggested and it was really easy. def will make again:) thanks for sharing this gem! Have made them twice now. 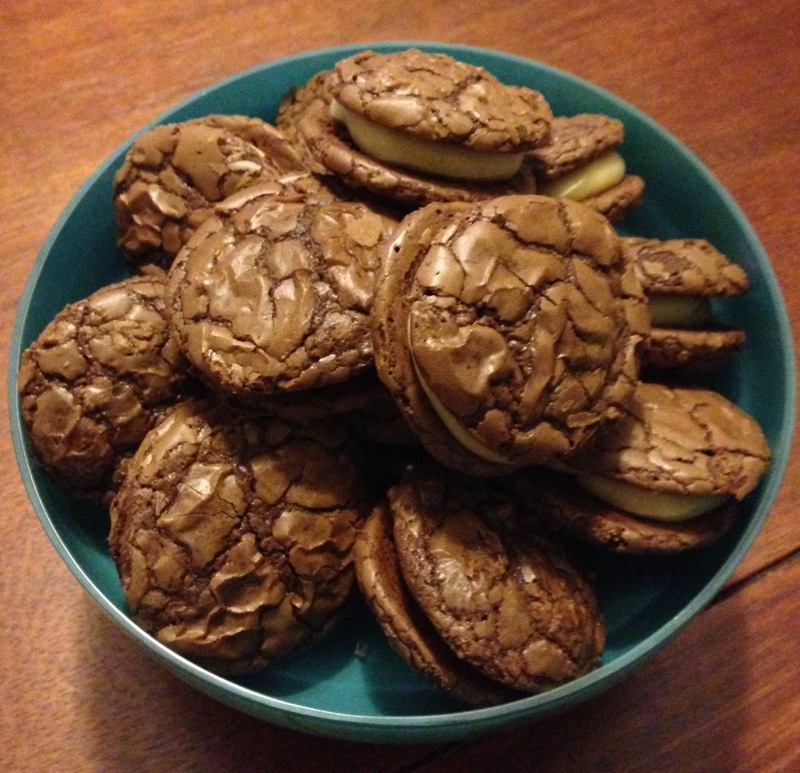 Even made just the cookies once because I didn’t feel like making the buttercream….absolutely scrumptious. 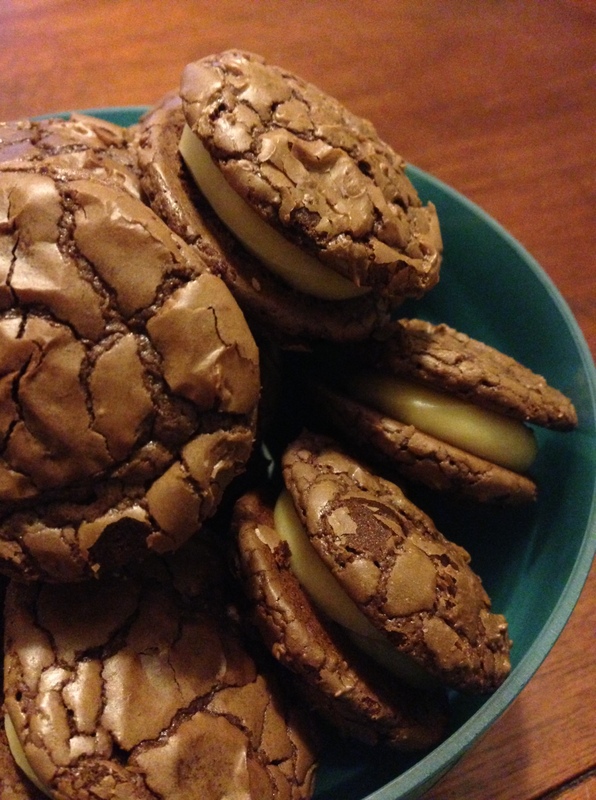 I was looking for a brownie cookies recipe from scratch for a while now, so I am glad to have come across this recipe. I hope I get to try it soon. Also I just wanted to say I love the name of your blog! Could I use 1/2 and 1/2 instead of cream for the frosting? Thx. Half and half is a little less stable, but using it shouldn’t affect the flavor or consistency much, so you should be fine! Any suggestions if I only have semi-sweet chocolate chips? Go ahead and use them! Should be no problem at all to substitute them, the brownie part will just be a bit sweeter. THANKS for the super quick reply! If I do use the semi-sweet chips, I’ll be sure to post how sweet they turned out. Yet I might be on a mission for bittersweet chips as the original recipe looks perfect! THANK YOU!! Can these be made a day or two ahead? The texture won’t be as good if you make them ahead (the outside will lose that nice crackly crispness), but they’ll definitely still taste good! Ok thank you. I was planning on making them for a chili dinner at church, but I only get off work an hour and a half before. So I was wanting to make the cookies on Friday, but wait and do the buttercream and put them together on Saturday. Bringing them to a party tonight but not sure whether to store in fridge or container? I’d leave them out at room temperature, NOT in an airtight container. That’ll keep them a bit crispier until you’re ready to serve them later today!